Having eaten, it's time to explore the shops in Jackson Heights. There are few other places where the store fronts offer such a sense of decadence and vibrancy. 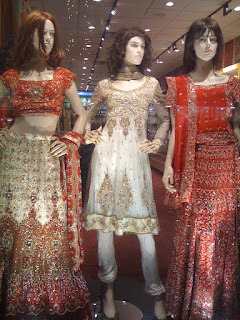 Garments in colorful fabrics with intricate embroidery adorn mannequins, while ornate 24K gold items gleam brightly from behind thick glass panes. This place calls to true fashionistas—the flurry of color and sequins (and increasingly daring cuts for tops) and heavy jewelry pieces may not appeal to everyone. 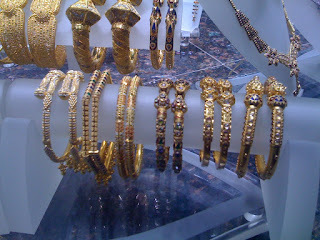 The degree to which gold is embedded in Indian culture is apparent from the shops that line 74th Street. However, while food and clothing (albeit at a lesser degree) serve in some ways to link South Asians immigrants to both mainstream and native cultural forces, gold seems to be mostly an internal currency. 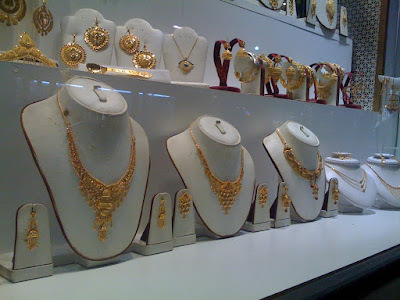 That is, while food and clothing are cultural identifiers that can be used with a greater public, gold appears to circulate internally within the immigrant group as a way to solidify their connection with one another. See, I told you you didn't have to go far to experience anthropology. As luck would have it, it's only a subway ride away. I'm interested to hear your take on the JH series, and the management of cultural resources by groups, particularly immigrant groups but any type of group you'd like to discuss is welcome. Hope you all enjoyed our little excursion to the Borough of Queens. If you'd like to visit, I dug up this little guide to help you along from the New York Times.